Summary of today’s show: Today is the 40th March for Life in Washington, DC, and Scot Landry in our Braintree studios connects with Fr. Matt Williams in DC and a series of guests from among the 500 pilgrims who have traveled there to give witness to life. From teens on their first march to veterans of decades, from students to priests, our guests talk about why they go to the March, what their witness provides, and how it will change their lives. 1st segment: Scot Landry is joined remotely by his co-host, Fr. Matt Williams, who is at the Shrine of the Sacred Heart in Washington, DC, ahead of the March for Life for this pre-recorded episode of the The Good Catholic Life. To see photos from the March, go to BostonCatholicPhotos.com and for live video from within the March go to BostonCatholicLive.com. Scot said one of the signature events of the March for Life is the Vigil Mass at the National Shrine of the Basilica of the Immaculate Conception, and this year Cardinal Seán was the principal celebrant and homilist. He delivered a wonderful homily, perhaps one of his best that Scot has heard. We played some clips from the homily. This year we are saddened that Nellie Gray is not with us, as she has been for 40 years. I call her the Joan of Arc of the Gospel of Life. As a young priest working here at the Spanish Catholic Center in Washington, I heard about Nellie, who had left her career as a lawyer, like the Apostles leaving their boats and nets, to embrace a special vocation to work on behalf of pre-born children. It was my privilege to help her organize those first marches, and I have come to every march since the beginning. Nellie Gray has been an inspiration to me and countless others. Surely she continues to pray for us from her place in eternity. The Gospel of Life is an imperative for Christ’s disciples. Christ through His Church is urging us to be defenders of life in the midst of the culture of death. The term culture of death, coined by John Paul II, is an accurate description of the drift of Western culture. Just last week, January 16, 2013, the newspapers reported a case of euthanasia in Belgium. Twin brothers Marc and Eddie Verbessem, who were born deaf, were recently diagnosed with glaucoma which could eventually lead to blindness. Judging their future to be too burdensome, they presented themselves at the University Hospital of Bruxelles and the forty-five year old brothers were both given a lethal injection. We recently managed to defeat a ballot initiative in Massachusetts that would have legalized physician assisted suicide. The initial polls had us losing 70% to 30%, but thanks to much prayer, hard work and alliances with a broad collation of hospice, health care workers, faith groups, disabilities people, Catholic colleges, and the hard work of our Knights of Columbus councils and our priests and parishioners, along with aggressive advertising, we actually won. … There is no doubt however that the next major assault on the Gospel of Life will come from those pushing physician assisted suicide and euthanasia. A society that allows parents to kill their children will allow children to kill their parents. During the past forty years, pro-life Americans have felt the frustration of being disenfranchised by an activist Supreme Court which has denied us the right to vote about abortion policy. Nevertheless, pro-life activists have not ceased to wage a campaign of moral suasion on campuses, workplaces and neighborhoods. It is amazing to think of the tens of thousands of volunteers working in the some 3,000 pregnancy help centers that provide over 2.3 million women in difficult pregnancies with invaluable help; medical, material and spiritual. Forty years ago when the Supreme Court handed down a second Dred Scott decision that renders unborn children, like people of African-American descent in the days of slavery, unprotected by the Constitution of the United States. Since 1973 there have been 55 million abortions – that is how many people there are in Italy, the United Kingdom or France. That translates into abortions for a quarter of all pregnancies. However, a study in New York City from last year shows that the abortion rate in New York City is actually over 40% and over 60% of black children are aborted. The same study showed a solid consensus that voters were shocked by the number of abortions, opposed tax payers funding of abortion and favored parental consent laws, waiting periods and accurate information about the abortion procedure and options. The same poll also indicated that 70% of the New Yorkers favored conscience rights for health care workers. I believe that this poll reflects the pulse of the majority of Americans. Sadly, the government is not listening to the people. … [T]o change the public attitudes of support for “abortion as a necessary evil” will require educating Americans about abortion’s impact on women and changing attitudes toward adoption. Too many Americans see abortion as a necessary evil. We need to educate the public on the damage done to women by abortion and show that abortion is not a necessary evil, but is simply evil. 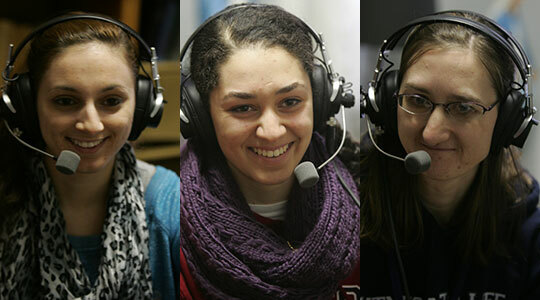 2nd segment: Scot welcomed to the show from Washington, DC, Jane Richard of Presentation of Mary Academy, Larisa Bogolomov, and Jackie Nader from Ursuline Academy. Fr. Matt said he took them away from a rally, but he hopes that they can provide a flavor of the pilgrimage. He asked Jackie why she wanted to come. She said she’s wanted to come since she was in seventh grade. She wanted to do something so much bigger than her and to come see the hope and to see how inspiring it all is. She’s been the basilica before, but not as full and maybe no one has ever seen it as full as it was yesterday. She said you could feel the Holy Spirit in the thousands of people united for a purpose. Larisa is a freshman at St. Mary in Lynn. She said she first started hearing about the March during the first week of classes and people have been talking about it ever since. As she learned more, she knew it was an issue she cared about and wanted to come and do something about it. Fr. Matt noted that Larisa also took part in a special event regarding physician-assisted suicide. He asked her about her impressions of the basilica. She said she’s never seen a church so full in her life, especially full of young people. Fr. Matt asked Larisa what she has found challenging about the pilgrimage. She said it’s been challenging to wake up so early each day and riding buses for so long. But they were prepared to offer it all up. Fr. Matt asked Jane about her Marches and she said it’s her fourth March. He asked what inspires her to come year after year. Jane said she’s always wanted to do this as a mom and she loves that it’s her job description. She loves to see the change in the students, how their faith goes from their heads to their hearts. Scot asked Jackie why the March brings her so much hope. She said seeing people from all over the US in one place is so inspiring, t hat they’re all here to pray for life, to bring dignity and respect to women and children. Scot asked Larisa how she would respond to people who say pro-woman is pro-abortion. Larisa said in the March, she’s making a small difference for women. Fr. Matt said Cardinal Seán said we’re called to change hearts, starting with ourselves. We need to help people come to know Jesus, which then helps them to see the dignity of human life. Jackie said she’s learned in school that to know someone you have to love them. By knowing and loving other people you realize the good in other people and you’re able to do good for others. Scot asked Jackie about the experience of the long bus ride. He said his trip to the March was almost 20 years ago and what stands out for him was how fun it was to take the long bus ride. Jackie said she was happy to share this experience with friends and it didn’t seem like eight hours. They also did icebreaker activities with girls from other Catholic schools. They also watched videos that helped them understand what they were doing. Scot said this is the first time that the founder of the March, Nellie Gray, isn’t there. Scot asked Jane how it’s different from others for her. She remembered being in high school when abortion became legal. Jane said to be here now is to see a whole generational turnaround. She’s amazed to see that so many students don’t even know what Roe v. Wade and don’t know anything about abortion beyond the termination of a pregnancy. It’s significant for her to be able pass on the truth. She also noted how the Cardinal is expanding the message to marriage, the gift of fertility. Fr. Matt asked them to give practical tips for how to encourage kids to get involved in the pro-life movement. Jackie said the girls on the bus got pins that show the babies’ feet at eleven weeks and they were amazed. She encouraged others to use the concrete visual reminders. Larisa said in her school they’ve watched videos and had speakers come in and the students even started to have conversations on their own at lunchtime. Scot said with Catholic Schools Week next week and the girls representing Catholic education so well, he asked what they would say to those who wonder if Catholic high school is worth the investment. Jackie said it’s definitely worth it. There’s so much love and joy among them and they can practice their faith freely. She said it helps you find your faith in an open environment where people share the faith with you. Jane said as a parent it’s well worth the sacrifice. she said Catholic school faculty go above and beyond in their teaching with an integrated approach of heart, mind and soul. Fr. Matt said these guests inspired him and the Holy Spirit must have led them to the show. 3rd segment: Scot now welcomed to the show Fr. Jason Worthley serving three parishes in Somerville, Fr. Michael Sheehan of the Franciscans of the Primitive Observance, and Fr. John Currie of St. Joseph, Holbrook. Scot said he was able to watch Fr. Currie praying the rosary with the pilgrims on the bus during on of the live video broadcasts. He asked Fr. John how many Marches for Life he’s been on. Fr. John said it’s his third in DC and he’s been to a number in Boston. He said being with the kids was awesome. The joy and hope of the 13 and 14 year older is contagious. They’re so open and their hearts and minds are receptive. The conversations lead them to deeply cherish the moments they have to be on pilgrimage. Scot asked Fr. Jason how often he has come on the March. He said it’s his first March and he felt a need to come and witness to life. It’s been a great source of joy and inspiration. Scot asked what he will bring back to Somerville. Fr. Jason said it will be the tremendous gift of the unity he’s seen. All those who’ve come have endured great sacrifice to be there. Fr. Matt said Fr. Jason was telling him how awesome the experience was to be at the Mass. Fr. Michael said this is his ninth or tenth March, but his first as a priest. He said it was a joy to concelebrate the Mass with Cardinal Seán especially to see how the crowd reacted to what Cardinal Seán said. As a priest, he finds himself even more pastorally sensitive to the pilgrims. Some of them don’t even know at first what abortion is, and then to guide them after they have decided to want to help people in this area. Scot asked what they have heard from the pilgrims last night being in an overwhelming crowd and hearing Cardinal Seán’s awesome homily. Fr. Jason said there are many inconveniences in a pilgrimage but among all the pilgrims he talked to none of the inconveniences bothered them. They have joy at serving a cause beyond themselves. Fr. Matt said on his bus he focused with his pilgrims that the Mass last night would involve sacrifice with the heat, crowds, and long lines. There must have been 20,000 people present. They teach them that when they offer up a sacrifice that they’re sharing in what Jesus did on the Cross and God can never be outdone in generosity. One pilgrim told him that she felt a sense of peace as she offered up her sacrifice. Scot said Fr. John said on his bus that a pilgrimage can change you. Fr. John said a vacationer uses a place, a city or town to benefit their own interests: hotel room, amusement park rides, etc. A pilgrim goes to be transformed by a place, the people, the history, and the prayer. He encouraged the kids to know they were being transformed by the pro-life movement and in their own way would leave a mark on our society and they would do it with sincerity. Fr. John said a number of kids asked him later to explain it once again. He said our world doesn’t understand that the face of the March for Life has changed over the years and how it has become so young. Young people are standing up for life. Scot asked Fr. Jason what he wants listeners to know and see for themselves. Fr. Jason said most of those there at the March were born after Roe v. Wade and they realize that at one point our government said they did not have a right to exist and to have life. It’s a matter of justice. Scot asked the same question of Fr. Michael. He said an 18-year-old girl and 13-year-old boy going to confession, having come on the March thinking it was going to be a vacation, but later realizing that this movement won’t just take my time, but will take my conversion. He hoped that everyone who hasn’t gone to the March yet will see that same need. Fr. Matt said it’s wonderful that the pro-life movement has become so young. He can’t help but think of the mutual giving of gifts between the young people and the priests. The priests give a gift of a witness to radical self-giving to a greater cause and he can’t imagine how many have a vocation to religious life born out of this. 4th segment: Scot welcomed Fr. Mike Harrington from the Office of Cultural Diversity, Tanya Skypeck from St. Clements Young Adult Ministry, and Victoria Spayda from Norwood, now attending St. Joseph College in Maine. Fr. Matt said they have three tracks on the pilgrimage: Middle School, High School, and Young Adults. Tanya and Victoria represent that young adult track. Tanya said it’s her second March. She does it because of the witness in the world in the cultural of death. It’s moving to her to explain to her co-workers about why she’s going for these two days. By being here and explaining to people why she’s going, she’s participating in a battle for souls. Fr. Matt said her witness here in DC is an open door to witness back home at work. Fr. Matt said Victoria is a freshman and went on her first March with Fontbonne Academy last year. She is the sole representative from St. Joseph and is missing two days of school. She said last year was a incredible experience to hear the witness talks from the women who regret their abortions and to be with thousands of people. Fr. Mike said he’s been coming for 20 years. Fr. Matt asked how he’s seen it change. Fr. Mike said the March has grown significantly and there are more and more young people. Every year there’s another rally and another vigil because so many are filling up.He said it’s like being at a World Youth Day with so many young people everywhere. Fr. Matt said the fact that Boston has its own rally now is because so many other rallies have been sold out in past years. Now the Shrine of the Sacred Heart seats 700 people and was standing room only and so their rally is filling up too. Scot asked Tanya what led her to say last year that she has to go back this year. She said last year it was a fun pilgrimage with great people and she enjoyed most the Boston rally and to be together with them, people from home in a completely different city. She wanted to be here also because of the significance of the 40th anniversary and as a young woman to say publicly that abortion is harmful to women. Scot said the schedule of the pilgrimage is pretty busy. He asked Victoria what’s the most moving aspect. She said most moving for her was hearing all the people at the Mass last night singing together and praying together. Scot asked Fr. Mike why it’s so important in his own witness, not just as a priest, but as a Catholic to be there every year. Fr. Mike said the issues they are walking for touch us all personally. He’s noticed on his bus that the prayer has been beautiful. The issues they’re talking about has affected everyone personally, that everyone knows someone who had to face tough decisions and struggles in life. The prayer intentions have been so personal and meaningful. He added that he’s proud of Cardinal Seán, watching him lead the celebration with power and witness and emotion. He was very moved by seeing him there. Scot said Tanya said something she enjoys is sharing her experience with her co-workers. He asks how she shares with people who might be hostile to her for it. Tanya said she forms herself through reading the Church’s teachings, going to Mass and being particularly attentive, and doing anything she can to engage her brain. She’s been taking classes at the Theological Institute for the New Evangelization, which have helped her to be able to respond to the mindless rhetoric people spout at her. Study helps her prepare ahead of time to recognize those things when she hears them and to know how to respond. It’s also been a gradual process to become more and more bold and be able to speak up. Fr. Matt asked Victoria how she’s kept her faith alive. Victoria said before she got to school she applied to work with campus ministry and that’s kept her very active there. The community she had in high school has built her up to prepare her faith to be strong as she ventures out. Scot asked Victoria what she hopes for her witness to fellow classmates that might lead them to come next year. She’s going to push hard to get a group to go. She’s going to work with the campus minister to get him enthusiastic about it.